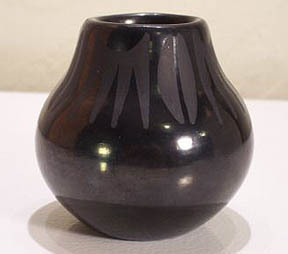 Clara Martinez's work has often been confused with Clara Montoya, a sister of Maria Martinez. 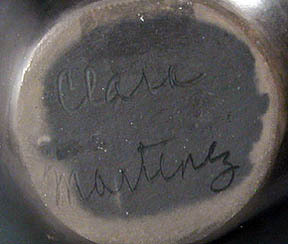 The two signatures below are quite different from each other and have caused much confusion in the identification of Clara Montoya versus Clara Martinez. Both these two signatures have been confirmed to be Clara Martinez by many people from San Ildefonso Pueblo and also from her daughter Jeanette Martinez Piatt. 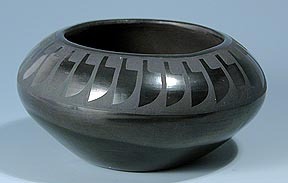 One explanation for the significant difference in these two signature styles is most likely due to several years if not several decades of time between the two pots and the two signatures. 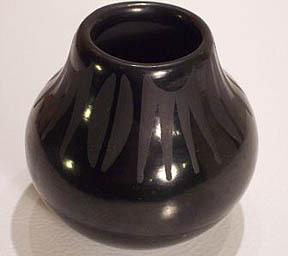 The older and more vertical pot is probably 10 to 30 years older than the feather design shown – hence a more mature signature with the feather design. In our opinion the identification of these two pots author is very important in determining what is and what is not a Clara Montoya piece. Luckily for everyone there are still people around like Jeanette who can give us a very definitive identification of these two pots. 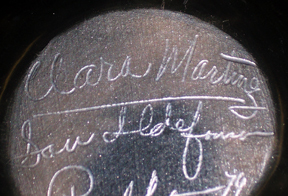 This Clara Martinez signature looks quite different than the other signature. However according to Jeanette Martinez they both are from her mother Clara Martinez. This particular signature has created some interesting discussions. When you first look at it the hope is it is a Clara Montoya signature. However it is actually Clara Martinez the wife of John Martinez and daughter-in-law of Adam and Santana Martinez. We confirmed this through a handful of people at and San Ildefonso Pueblo including Jeanette Martinez Piatt who is the daughter of Clara Martinez herself.